Dracula by Bram Stoker is one of my all time favorite novels and, like many others, was probably the beginning of my lifelong love of the vampire, both the romanticized versions and those with more of a darker nature. I admit I’ve always been curious about what took place on the ship Dracula was transported to England on. In Stoker’s novel we know the vampire is a stowaway, hidden away in his crates of foul dirt, and that no one is left alive to steer the ship into port at the end of the voyage. But we get little on the journey itself. I was intrigued when I read the blurb for Dracula’s Demeter and decided to pick it up straight away. I’m pleased to say I found the writing excellent, perhaps even surpassing the original novel by Stoker that it’s based upon. The pages easily held me mesmerized, perhaps a little of the Count’s mystical powers involved because I found it difficult to put the novel down once I’d started reading. We are drawn quickly into the lives of the unlucky crew and the single passenger fated to die aboard the Demeter. They come across as real people, the descriptions and individual personalities shown in vivid 3D color. The tension level is kept high throughout, which in my opinion is the key to any good horror story. The reader swiftly begins to feel the growing terror of these people, trapped on a ship with a monster out on the open seas. A warning here; you may want to read this novel during the daylight hours because all the senses are brought into play, including fear and disgust. When the storm rages around the ship, we can almost feel the spray of the saltwater on our face, smell the Count’s fetid breath brush against the neck, feel the stickiness of blood. For sure it’ll bring out a shiver or two. As we delve deeper into the story, one can’t help but hope for a miracle to arrive in time to save these doomed people. 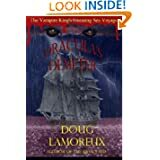 If you’re like me and always wanted to know what took place at the beginning of the famous Count’s journey from Transylvania to England, and you enjoy the scare of a good horror story, then Dracula’s Demeter is the novel for you. I’m looking forward to reading the next novel by Doug Lamoreux. Posted by Denna Holm on July 17, 2012 in Archives and tagged cursed, Demeter, Dracula, fantasy, five star review, Horror, ship, vampire.